A man who helped to stage a bomb hoax using a rucksack filled with batteries wrapped in black tape has been sentenced. 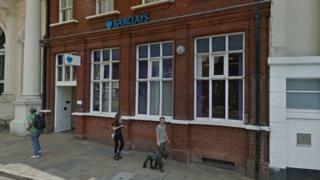 Mark Brett's phone was used to tell police there "may be a bomb" inside Barclays in Sudbury, Suffolk. The branch was evacuated and an Army bomb disposal team called in to deal with the fake device on 31 January. Brett, 41, was given a 12-month suspended jail term after being found guilty of communicating of a bomb hoax. His fingerprints were on the device, Ipswich Crown Court heard, but someone else he had been talking to outside the bank had planted it. Police said there had been no other arrests in connection with the case. Oliver Haswell, mitigating, told the court Brett has gone to great lengths to turn himself around since the hoax. Det Insp Tamlyn Burgess, from Suffolk Police, said: "The incident caused great disruption to the town centre of Sudbury. The area had to be evacuated in the interests of public safety with a wide cordon put in place. "At the time, the incident caused considerable alarm amongst many people and also meant many valuable police resources had to be diverted from elsewhere so to see Brett convicted is of great satisfaction." Brett, of Tudor Road, had his sentence suspended for two years and he was ordered to do 180 hours of unpaid work and to take part in 15 days of rehabilitation activity.